The Retriever Mix again body slammed Una, aroused from the chase, and feeling another shot of pain in her back, she dropped the ball and reprimanded the Retriever Mix by putting her mouth on his neck and giving him a good hard shake, then let him go. The Retriever snatching up the ball, and returned to his owner as if nothing had happened. Red, the Chow on the left is engaging. 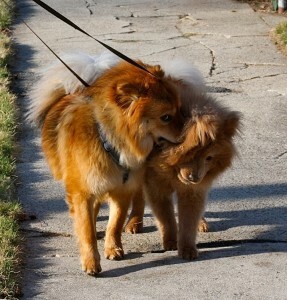 Kandi, the Chow on the right will tolerate this for a bit, and then will growl and snap. Red takes the reprimand every time as is their relationship. Una’s response to this Retriever’s use of body contact when playing was very appropriate in her mind, and she tried to return to playing chase with the Sheltie as she was enjoying this type of play. 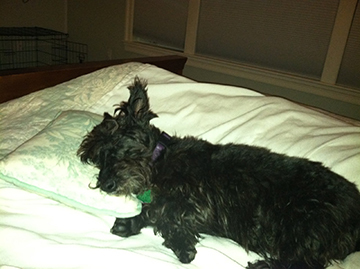 Response: Unfortunately, her owner saw her as being aggressive, and called Una in a harsh tone. Una went to her owner who is usually trusting and gentle, but not this time, she was stiff and grabbed Una’s collar — nearly lifting her front feet off the ground. Her owner is usually very excited when she comes when called, so Una was quite confused by this aggression. The ride home was scary as her owner verbally scolded Una in a harsh tone. 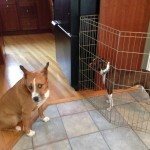 Once home, Una was grabbed firmly by the collar and put into her crate while her owner continued to stomp around the house and gave Una hard-eyed stares. 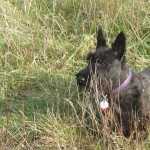 Una has now learned when her owner calls her it makes her feel very unsure and afraid. 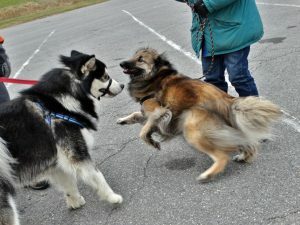 This Malamute, Loki is moving forward as the Tuverian Shepherd, Nell is moving away. 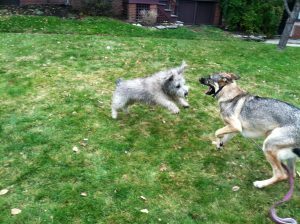 These two dogs have very differnt play styles as they are beginning to discover, having just met. Humans also respond with different levels of feedback depending on age and life experiences. If the Retriever had lightly rubbed Una’s shoulder as he was heading to the ball or lightly bumped her body when she won the ball, she may have only turned away or growled. Did I mention Una initiates play with a play bow followed by a game of chase. She does not enjoy wrestling. Did Una have time to tell the Retriever Mix how she liked to play? Did he even ask? Is it possibly the Retriever has learned that a hard body slam is therefore more likely to win the ball? Will Una’s feedback prevent him from body slamming another dog? Doubtful, however it depends on his temperament and his sensitivity to a reprimand. 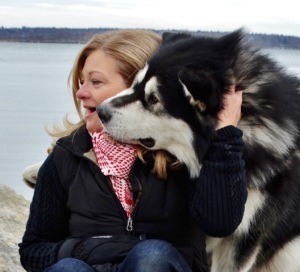 This Alaskan Malamute, Loki has not seen me in about a year. His use of space is very clear, he likes to be close! My point: If your dog scuffles with another, consider the entire incident. How well do they really know each other? Was their contact made before an invitation was offered? Was one dog trying to steal a resource from another? Do the dogs have different styles of play? If one dog is a wrestler and another only enjoys chase, then you can expect some conflict to occur. If the reprimand or feedback given ends in a puncture or broken skin, take a breath and ask your self how many times has your dog played with other dogs and not broken skin? If the answer is many, then you can assume these two dogs were very different and conflict was somewhat expected. If your dog is beginning to reprimand dogs more often, then slow greetings down and be sure the dogs have similar personalities, play styles and time to signal intentions. This will not only reduce conflict, it will reduce the level of reprimand, and make for a far more enjoyable ride home! This sweet girl is a loud alarm barker! acting a bit growly with strangers? Does your terrier like to grab and shake toys? How about your adorable herder? Ever nipped at anyones heels? Protect the herd from predators by alarm barking. Could find or flush out the bird or grouse to be hunted. Retrieve a kill after it was shot. Kill pesky rodents and small animals that jeopardized the crops. Desired traits which were specifically bred for in the past may not be so desired for a family pet. A lazy, relaxed calm dog was not as desirable and therefore not chosen for breeding. 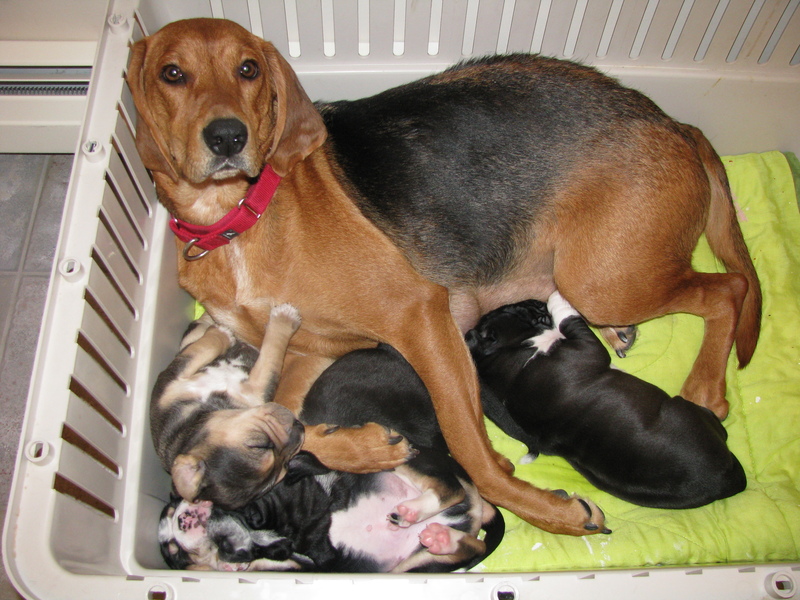 Hound dogs were used to search and track, which meant their nose needed to be on the ground. Sporting dogs were used to search, stalk and point at their prey. Herders were bred to drive and chase, and, yes, even nip at heals when needed. Example, the Corgi was encouraged to nip the heels and bred low to avoid the kick back from the hoofed animal they were moving. Shelties were bred to bark when herding as they used noise to drive the herd. Terriers and heelers were bred to grab and hold and were even knows as “catch dogs” as this was a desired motor pattern. Retrievers were used to bring birds back to their handler using a soft mouth. To learn more, here’s a useful link: Ken McCort, Wolf Park Educator. Alert and ready to hunt. consider if this behavior is a normal one to your dog’s breed. You may never extinguish a behavior trait that your dog was specifically bred for. While this behavior can be modified by rewarding another behavior, you must be realistic with your expectations during the behavior modification process. 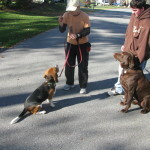 Many dogs get a reputation for being dog aggressive, when they are simply responding to adolescent dogs with rude behavior. 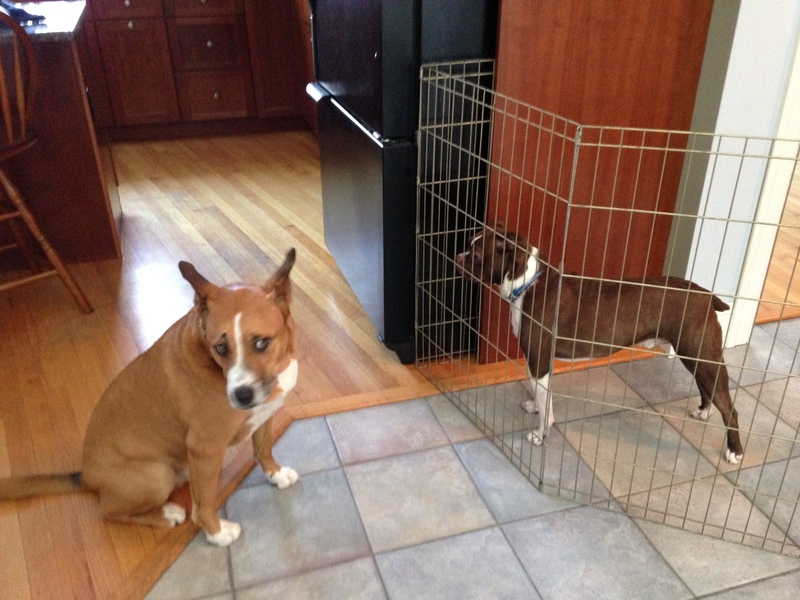 My foster beagle was one of those very rude adolescent greeters who invades other dogs space without an invitation. I knew he would eventually receive some feedback, I just wanted it to be an air snap or nip and not a level 3 grab and shake. Well, it finally happened, as I approached a neighbor with a calm female labrador, my foster boy wanted to walk right up to the labradors face who was standing tall, motionless, mouth closed tight, tail a bit high and not looking at my pup at all. I could easily see my boy was not being invited into the labs space, but hey, he has to learn to read his own species body language as a part of growing up, right? So, while I slowed his approach, and his body was wiggling, the labrador showed her teeth and snapped at my dogs face, again, my foster pup wagged harder and tried to approach a bit lower and more submissive, he was once again met with lots of teeth along with an air snap. Understood! The beagle finally understood the labradors signals that he was not invited into her personal space! My pup calmly walked farther away, sat down and never again looked at the labrador as we continued to speak to one another. My neighbor apologized profusely and would not stop going on and on about how rude his dog was! I let him know that it was my foster dog who was NOT invited into his dogs space! In fact, his dog was very clear when we were 20 feet away that she was not interested in visiting. 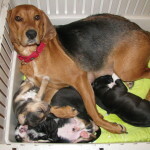 Many puppy’s and adolescent dogs need a few reminders to respect the space of others. The Boston Terrier is getting necessary feedback from Pablo on the left. I am NOT your friend and I do not want to be social with you. If your dog invades another dogs space who is looking away, standing stiff, immediately sniffs the grass or scratches himself, then he is not inviting your dog near him. This dog may send more obvious distance cues in the form of a growl or snap. 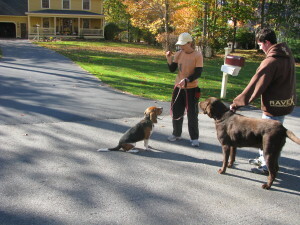 This is not aggression, it is simply normal distance cues from one dog to another, a request for one dog to move away. In my experience, humans have unrealistic expectations of how our dogs should behave. How can we label dogs when most of us have very little knowledge of how dogs communicate. If you are a dog owner, please take time to learn more about dog behavior and body language cues before saying your dog is aggressive. 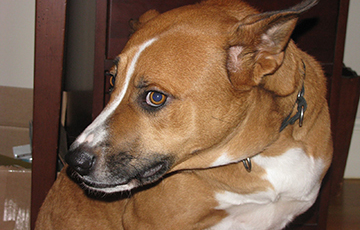 It is very possible your dog is simply reacting to the other dogs rude behavior! 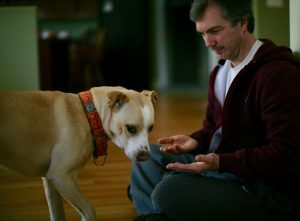 Do you ever wonder why your dog performs certain behaviors or motor patterns? I sure have! For example: Why does my dog roll on smelly things? Why does my dog shake his toy? Should I be worried if my dog stalks his playmate? Why does my dog guard his bones? Hunting, for fun or survival? Specific behaviors that are unique to our dogs are called Phylogenetic behaviors. These behaviors, or behavior patterns, have developed over many many generations and truly have evolutionary significance to maximize reproduction and survival. Stalking and bouncing are examples of phylogenetic behavior, as is an innate fear of loud noises. Behaviors observed in just the hunting motivations: orient to sound or moving object, stare, freeze, creep, stalk, run, jump, grab, hold, shake, hold down, kill, eat, guard. Can we change phylogenetic behaviors? All behaviors can be modified to some degree with patience and a strong counter conditioning process. 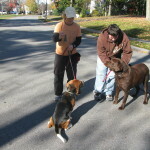 Inherently genetic behaviors may be strong in your dog and low in my dog, as each dog has a different genetic make up. Such as rolling in feces, a yucky behavior to us humans, but many of our dogs do it! Why? The science behind this behavior is that our dogs roll in animal feces or on a dead animal so they can mask their scent to better help them sneak up on their prey. Does your dog need to stalk his prey for survival? Unlikely, but this behavior can be a strong genetic trait. Resting for the next hunt. We know some dogs learn to play fetch just by watching another dog play fetch. This is called Social Learning. 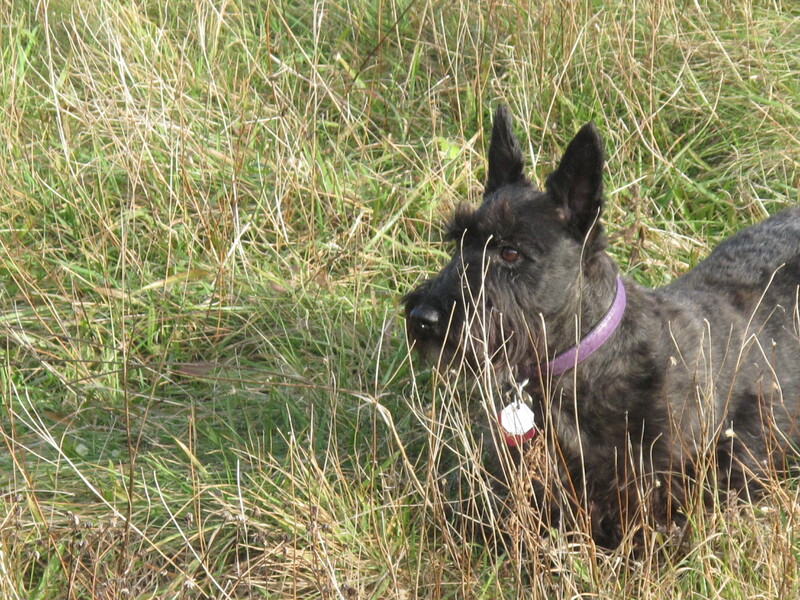 Other dogs perform behaviors for the reward, for example my female Scottie will frequent my neighbors back yard and scan for a squirrel to come down the bird feeder. She has been successful on two occasions and enjoyed eating them as well. Does she need to hunt for survival? No, but this behavior is both rewarding to her, and a strong genetic trait, therefore she will repeat it. 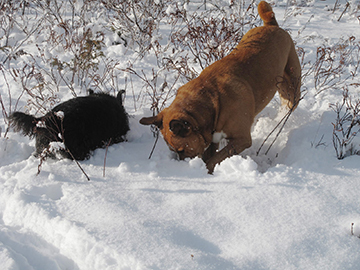 Many dogs use hunting behavior patterns in play, others will use sexual motor patterns like mounting and neck biting to initiate play. 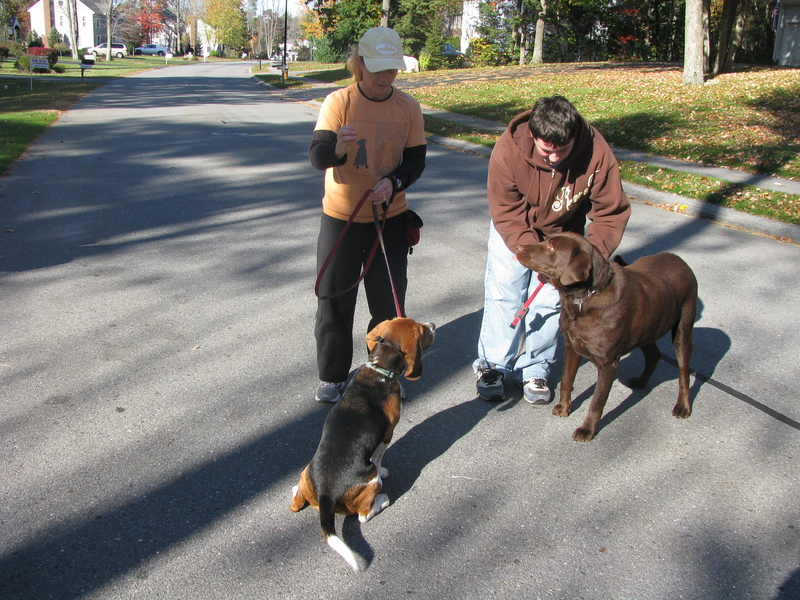 The point is our dogs do many behavior patterns as a result of their genetic make up. If this behavior is followed by a reward, then this behavior will most likely continue to be practiced.